I've been trying to find a delicious way with black eye peas for years, and here's one I'm finally happy about. It's a great combination of flavors, and can be easily adjusted for any families taste buds. 1. Use a heavy, non-reactive cooking pot. Place black eye peas and enough water to cover them with an extra inch of water above the peas. Bring to a boil, then turn off the heat, cover the peas and let them soak for 1 hour. 2. Drain the peas, then cover again with fresh water. Cook the bacon, then roll the bacon in a paper towel to remove most of the fat. Add the onion, pepper, bacon, garlic, and chili powder to the peas. Cook for about 1-1/2 to 2 hours, until the peas are tender. Test for tenderness by tasting them. 3. Add the greens and let cook for several minutes, until they are tender. Kale takes about 5 minutes, as do braising greens. If you use collard greens, you may need to cook them a little longer, up to 25 minutes. If you use spinach, you'll only need to heat them for about 1 minute, as they cook so quickly. Add the barbecue sauce, tomatoes or salsa, and wine. Keep on the heat until hot. Taste, adding salt if necessary. 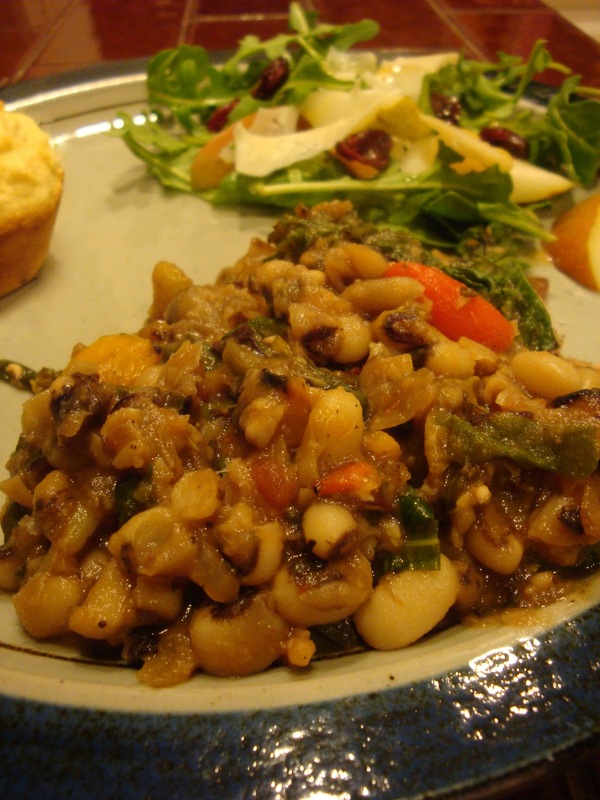 Stealthy Cooking Tip: There's an old tradition of eating black eye peas on New Year's Day. The story goes that you'll receive good luck with each pea that you eat. Stories like this make eating new foods fun, so, eat up and enjoy the luck! Serve this with cornbread and a salad for a full meal, or as a side dish with a small (3 or 4 ounce) portion of meat and a salad.